This is such a great newspaper find with Mormon Missionaries and possible family both referenced even if not directly connected. First the missionaries. There wasn't much information easily to find about Abednego Spencer Williams (1827-1896) born in Blaenau, Monmouthshire, except that he came to Utah in the 1880s, and is buried in Ogden City Cemetery. There's a bit more for Israel Evans (1828-1896). His story reads like an overview of westward expansion. Born in Ohio, his parents joined the LDS Church and moved to Missouri when he was only five. They relocated to Nauvoo, Illinois after the expulsion from Missouri and then left Nauvoo ahead of the mobs to follow Brigham Young. Israel marched with the Mormon Battalion in the War with Mexico and was present for the discovery of gold at Sutter's Mill. Instead of becoming a rich Californian, he went to Utah. He served a four and a half year mission to Wales and led a successful handcart company (only two deaths) to the Valley in the turbulent year of 1857. 14 April 1856. Monday at 8 o'clock we made a start for the station were there was many waiting both Saints and Strangers to see us start. At the appointed time the train was ready and we jumped aboard mid the cries of some, the joys of others, the frowns of others - all to no purpose. The Saints were determined in their course and scarce a tear moistened the eye of an Emigrant as they bid farewell forever the miseries of Babylon. That last bit from a man who had already seen the desert valleys and left the gold alone. Rhetorical flourish? Knavish fraud? More likely-- it's sincere faith, hope, and charity. Now for John Vaughan and the Magistrates. 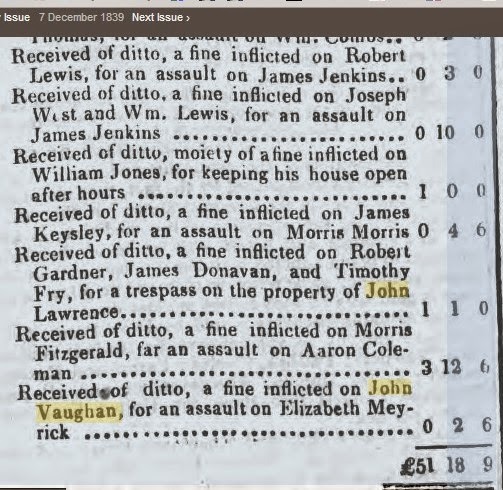 There is not enough evidence yet to conclude this was John Vaughan 1825 who horribly assaulted Mrs. Rees. A trip to Gwent Archives is coming due and will be made eventually. The Magistrates appear to be sitting in Merthyr Tydfil, but that's not too far for John to appear. It does fit a sad pattern. We have already addressed this one that does seem like a prank of carousing, young adults gone wrong. There is, however, another brief reference that indicates John 1825 may have had some ongoing problems. 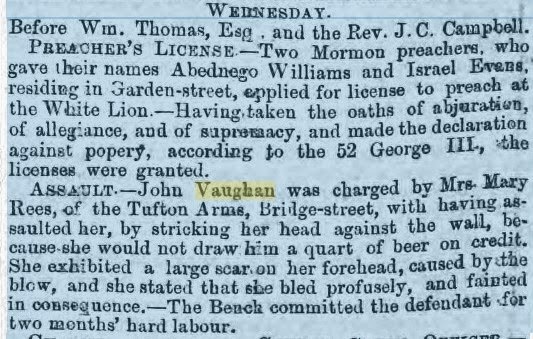 This last one is right about the time John and Maranah Watkins Vaughan relocated to Durham, England as Martha Maranah was christened there on 5 October 1864. The 1861 Census found them in Bedwellty not far from Pontypool. And, we've talked before about generational patterns. 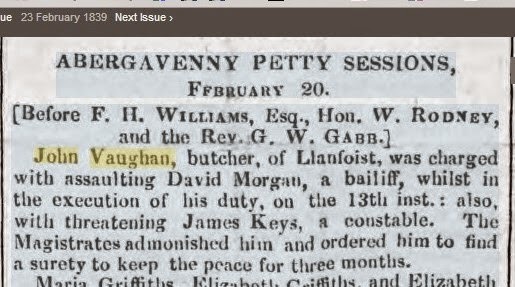 All of the above could only be John 1825 as John Vaughan 1789 died in Llanfoist in 1861 (fortunately, after the census). He is a much better match to earlier reports of problems among the Vaughan men. There's an Elizabeth Meyrick in Bedwellty in the 1841 Census, born 1811, which is close enough in geography to be the victim of assault by our John Vaughan. But, there are four "John Vaughans" in Bedwellty alone in the 1841 Census! Our John 1789 may be off the hook. If only the butcher of Llanfoist wasn't so clear in the fine just above. 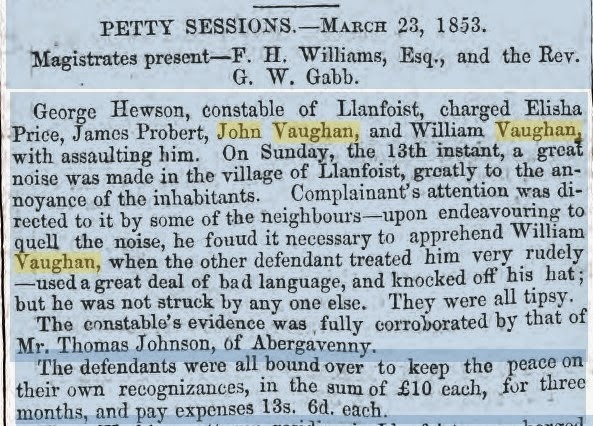 And, if only John 1825 and his brother William 1830 weren't so clearly in the drunken incident at Llanfoist with the constable's hat. We will be digging into court records to straighten out what we can. And the problem remains with only a religious solution. Death is all? No, I believe in a God of the ultimate Good. If any sin at all can cut one off from the presence of God and a Savior is necessary to atone for sins on condition of repentance and baptism, then how can the dead possibly be with God without some mechanism to make the atonement and ordinances effective? The answer is proxy work on their behalf in the Temples of the Living God. Don't believe? You don't have to. Human agency is always free until final judgment. And a lot of work is and will be going on in the Spirit World and the Millennial World when Christ reigns in glory on the earth. That's the faith, hope, and charity that Israel Evans and Elinor Vaughan shared. And it's the same that keeps me going until a better day before a perfect court of love. Vacation Scandal! Conspiracies! Oh my! Remember When Government Was Good?